According to a new eMarketer report, US native digital display ad spending is estimated to increase by 36.2% to $22.09 billion in 2017. 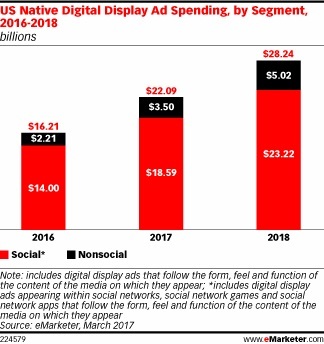 That means it will make up almost 53% of all display ad expenditure in the US in 2017. The predictions are split into social native and non social native. While social takes up the biggest chunk, non social native is also expected to rise by 43% from $3.5 billion in 2017 to $5.02 billion by the end of 2018. Mobile is a key driver, with native mobile display ad spending projected to increase to $19.50 billion this year, which represents 88.3% of all native advertising. Lauren Fisher, an eMarketer Analyst explains that this rise in native digital display is largely due to a push by publishers trying to create premium, mobile inventory whilst advertisers are calling for ads that are more engaging and less intrusive. ExoClick offers a responsive native advertising format that displays on mobile, tablet and desktop, click here for more information.